Does your therapist agree with you all the time? Do they shower you with compliments and praise? Do they smile and nod a lot? Do they always let you lead the session? Have you noticed you invariably leave sessions in a good mood? These could be signs you have a supportive, caring, and empathetic helper—or they may be signs your therapist is too nice. Therapists undergo years of training and are expected to be competent in counseling skills, including skill in confrontation and challenge. However, therapists are also people. Which means they, too, can struggle with disagreeing, being direct, and challenging others, including those with whom they work. Unfortunately, this can be to the detriment of people in therapy. Consider the potential consequences of therapy with a too-nice therapist. If your therapist always agrees with and never challenges you, there is a good chance they’re not being objective. Objectivity is often a reason individuals seek counseling in the first place. Does “I want to talk to someone who doesn’t know me and won’t just tell me what they think I want to hear” sound familiar? If your therapist is subjective, you could be missing out on valuable alternative perspectives. It could be refreshing to hear your therapist state, “Here is another way to consider what happened …” before you make a major decision or change. Or, depending on your personality, you might respond well to a therapist being as forward as stating, “I have to challenge what you just said. I think something completely different is happening.” In subjective or too-nice therapy, such challenges are less likely to occur. A basic counseling approach many therapists follow is to let the individual lead the session. This is meant to make sure time is spent purposefully meeting the individual’s needs and to respect the expertise they hold regarding their own lived experiences. This is all fine and good, but have you ever gone into session and thought, “I have no idea what to talk about today”? This could lead to what feels like a wasted session (and maybe even wasted money). There are times it might be helpful for your therapist to be directive and actively lead the session. If you find yourself in a relationship in which you feel as if your therapist is being too nice (or too directive, too nondirective, too laid back, too confrontational, or any other too …), a good first step is to communicate how you feel. Let your therapist know you wish for more direction or challenge. There is no one-size-fits-all model when it comes to therapy. This is evident in the fact there are hundreds of different therapy approaches, with no one approach found to be superior to all others (American Psychological Association, 2013). What is important is your therapist is a good fit for you and vice versa. When the therapeutic relationship includes a strong bond, cultural understanding, and individualized treatment, therapeutic change is more likely to occur (Laska, Gurman, and Wampold, 2014). If you find yourself in a relationship in which you feel as if your therapist is being too nice (or too directive, too nondirective, too laid back, too confrontational, or any other too …), a good first step is to communicate how you feel. Let your therapist know you wish for more direction or challenge. Express your desire to learn more about their views or perspectives on the issues brought up. Maybe your therapist is intentionally being too nice. It may be a means to elicit a certain emotion from you or to move you to confront unsatisfying relationships. However, therapy tends to not work well if it is a mystery. If you feel confused or uncertain, ask your therapist to explain more about their approach and how they see therapy working. Such a conversation could give you the insight you need to tackle your presenting concerns. 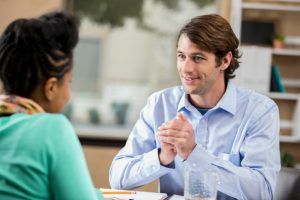 After having an honest conversation about your needs, should you find your therapist’s style is still not a good fit for you, don’t give up on therapy; instead, find a new therapist. Wanting a therapist who may be a better fit for what you need is not a personal attack against your therapist. Therapists recognize they won’t be the best match for everyone who seeks their services. Additionally, having worked with you, your therapist might have suggestions for another therapist they feel will better suit your needs. So if your relationship with your therapist is too nice, remember it is never too late to make a change in how you and your therapist work together—and it is never too late to change your therapist, either. American Psychological Association (APA). (2013). Recognition of psychotherapy effectiveness. Psychotherapy, 50, 102–109.